My father is listed as white on his birth certificate. His great-grandfather was the founder of America’s first black daily newspaper. But when I tell the story of my family, inextricably linked to the narrative of New Orleans and, in fact, to the country, I do not start with either of them. Aimée Potens, my third great-grandmother, stares at me. Holding a daguerreotype from the 1840s, I am transfixed by her eyes. I try to imagine what they had seen. Aimée’s eyes are my window to the world that made New Orleans, a world that seems impenetrable, lost somewhere in a gauzy historical memory of tangled white, free-black, and enslaved cultures. Aimée was born to an enslaved woman in the French colony of Saint-Domingue (now Haiti) in the late 18th century. She witnessed the long arc of Atlantic and Caribbean world history: slavery; the Haitian revolution; exodus to colonial Louisiana; the Louisiana Purchase; territorial plantation life; all things de couleur libre in antebellum New Orleans; the Civil War; emancipation; the birth of America’s first civil-rights movement via her son’s activism; and, in her final years, the triumph and failure of Reconstruction. Potens escaped the ferocity of the Haitian revolution as an infant in arms, eventually finding a home on the sugar plantations of St. James Parish, Louisiana. There she had children with another Saint-Domingue refugee, Jean Louis Roudanez. There she honed her skills as a healer. And there, those long, strong hands delivered babies, enslaved and free. Aimée later lived as a femme de couleur libre—free woman of color—in antebellum New Orleans. By then a single mother, she raised her children in the largest and most prosperous free black community in the United States. The proud, dynamic gens de couleur libres were Francophone and Catholic and lived within tightly knit enclaves of the French Quarter and Faubourgs Tremé and Marigny. Legally free, they were a caste apart, existing on the conflicted borderlines between American and French, white and black, free and enslaved. Frequently more affluent, educated, and cultured than whites, free people of color were profoundly influenced by the values of liberté, egalitié, et fraternité that emerged from the French, American, and Haitian revolutions. Madame Potens proudly wore a tignon, the headscarf required in colonial times as a reminder of “inferior” status. In the 19th century, Marie Laveau and other New Orleans women of African descent defiantly sported the tignon as a symbol of beauty. And family lore reveals that Aimée, like the voodoo priestess, was a powerful and proud healer who walked the streets liked she owned the city. And indeed, in her day, free women of color were powerful in many ways, often owning property and managing businesses in the French Quarter and the Faubourgs Tremé and Marigny. Louis Charles Roudanez, Aimée’s youngest child, grew up in this dynamic Afro-Creole world. He was likely influenced by the confidence that shone in Aimée’s eyes and her prowess as a healer and midwife. Young Louis was sent to Paris, where he earned a degree at the prestigious faculté de medicine. A student of prominent republican activists, Roudanez reportedly “took to the barricades” during the 1848 French revolution. Returning as an adult to an increasingly polarized New Orleans in the late 1850s, he was infuriated by the many indignities of white supremacy that France had spared him. White people would likely have addressed Louis Charles with the familiar form tu instead of the formal vous. But such micro-aggressions would have been of small consequence compared to the flagrant racism he faced. Tax-paying free people of color, while enjoying some measure of liberty, could not vote. They were denied “privileges” of citizenship, such as interracial marriage, public education, and public accommodation. Many whites worried that free and autonomous blacks might offer the enslaved hope for their own freedom, or even assist them in retaliating against their masters. The young doctor’s very existence as a prosperous and confident free black man directly contradicted the foundational idea of slave society—that servitude was passed down through blood and that racial inferiority was part of the natural order. Aimée’s eyes next fixed upon the howling madness of Civil War. In the spring of 1862, she saw many thousands of enslaved refugees pour into the city following Union occupation. With the Confederacy collapsing around her family, she watched her sons—Jean Baptiste and Louis Charles—emerge as leaders in an entirely new and powerful black movement to replace slavery with a fundamentally different and racially democratic society. In September, the Roudanez brothers and fellow Afro-Creole activists started the journal L’Union, the South’s first black newspaper. The front page of the inaugural edition condemned slavery and published passionate correspondence from Victor Hugo. A black narrative was born, and immediately the free black community coalesced around the newspaper. Louis Charles soon inaugurated a new and even more outspoken journal, the New Orleans Tribune. Launched in 1864, the newspaper proclaimed itself an “organ of the oppressed” and defiantly vowed to “spare no means at our command” to end slavery and secure racial equality. Publishing more than 1,000 issues over six years, the journal infuriated whites and was unquestionably the most radical in the South, if not the nation. Roudanez had taken the fight all the way to the White House. 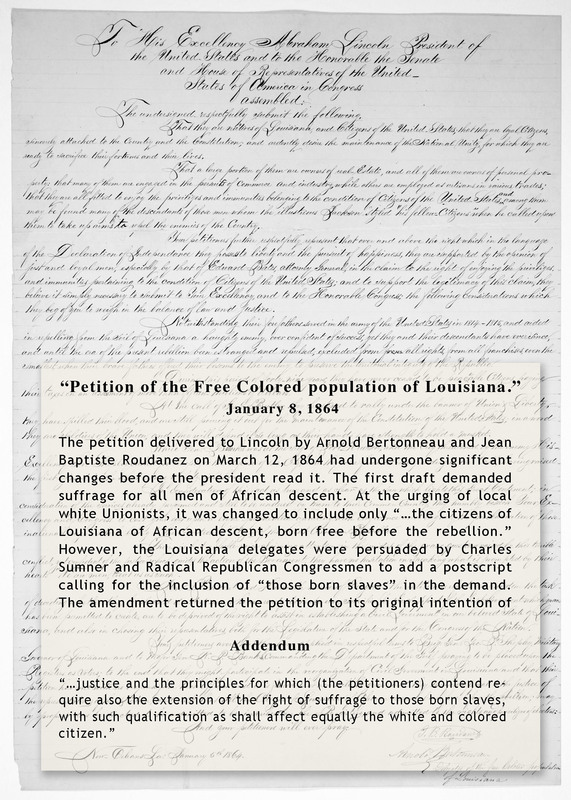 In early 1864, he and Arnold Bertonneau personally delivered a petition to President Lincoln, signed by over 700 black New Orleanians, demanding suffrage. Lincoln was impressed with these men, and although reluctant to endorse their cause, immediately advised the governor of Louisiana to consider restricted black voting rights. The following year, Lincoln spoke from the portico of the White House and suggested a limited black franchise for Louisiana. John Wilkes Booth was in the audience and remarked, “That is the last speech he will make.” Three days later, Booth made good on his threat. With Lincoln gone and the future of the formerly enslaved hanging in the balance, Aimée saw her sons work tirelessly for the vote, land reform, integrated public education and public transportation, the right to hold public office, and all the other rights that white society enjoyed. The Tribune became the voice of an organized black civil rights movement. Frequent mass meetings and protest marches were promoted and reported on. Aimée watched as her sons gave voice and agency to those whose skin color afforded them no place at the table. The Tribune radicals fought many difficult battles and faced some of the nation’s worst racial violence. The journal always insisted that the key to black power was the black ballot. Dozens of Tribune supporters organizing for the franchise were slain in the Mechanic’s Institute massacre of 1866, and the murderous white mob threatened to destroy the newspaper’s office. Roudanez and company did not blink, and instead intensified their crusade. Ultimately, the right to vote was achieved and enforced. In 1867, Aimée watched as black men enthusiastically turned out to elect black representatives who would go on to create the most radical state constitution in the Reconstruction South. The 1868 constitution included strong civil-rights provisions and contained almost everything the Tribune had campaigned for. Many newly elected state legislators were of African descent, and they implemented most of the Tribune’s platform, including integrated public schools. Aimée could not read or write, always signing documents with a bold X. Yet her eyes saw black children, eager to become literate, walk into integrated public schools in the 1870s. I imagine that, shortly thereafter, tears welled up in Aimée’s eyes. Reconstruction ended in 1877 with the withdrawal of federal troops, and Louisiana was abandoned to white supremacy. Her sons’ dreams dissolved into a nightmare of white terror, black disenfranchisement, and resegregation. Fears always present were now magnified and compounded by a widespread loss of hope. Louis Charles was contemplating an exodus to the safety of Paris. Despair descended upon the family, and Aimée died the following year. I was raised to be a white person in Jim Crow New Orleans. The past was hidden from me, and I grew up not knowing that this history was my history, too. When Reconstruction collapsed, the loss of hope for people of color was devastating. As I reflect on the ways the past has shaped the social construct of race and my own identity, I wonder what my story would be like had the Tribune’s crusade succeeded. Would my family have claimed its remarkable heritage instead of passing as white? As I write these final words, notebook in hand, I am standing in front of a Creole cottage on Ursulines Street in the French Quarter. It was Aimée’s last residence. I imagine her looking out the window, gaze fixed upon me. Those eyes hypnotize and I feel connected to forces much greater than myself. I stare back, falling through space and time, seeing what she did on these streets so long ago. This article originally appeared in New America. It was also published in The Atlantic.